FC Schalke 04 striker Klaas-Jan Huntelaar is guaranteed a place in Dutch footballing folklore after recently moving up to second in the Netherlands' all-time scorers' charts. He scored his 40th and 41st international goals on 5 June 2015 in a 4-3 friendly defeat to the USA to move ahead of national icon Patrick Kluivert, who has 40, and sit just behind Robin van Persie on 49. Such achievements seemed a long way off when he began playing football at an early age with his brothers Niek and Jelle, and signed his first youth contract with De Graafschap, aged 11. Over the next couple of years he was tried in various positions, before finding his true calling as a striker. In 2000, Huntelaar was scouted by PSV Eindhoven but, despite a prolific record at youth team level, he was unable to break into the senior side and loan spells with former club De Graafschaap and AGOVV followed. His big break came with SC Heerenveen in 2004/05, and a season-and-a half and 33 top-flight goals later, he was snapped up by his boyhood heroes Ajax. With the goals continuing to flow in Amsterdam, Real Madrid CF came calling at the end of 2008. Huntelaar scored eight times in 20 La Liga appearances over the second half of the campaign, but the following August Real nevertheless sold him on to AC Milan. A year later he was on the move again to another major European league, as Schalke sensationally swooped to sign him. A blistering start with the Royal Blues was interrupted by injury problems, but he returned in time to bag a brace in the 5-0 rout of MSV Duisburg in the final of the 2011 DFB Cup. It was a small taster of what was to come in 2011/12. Huntelaar's partnership with Spain legend Raul blossomed and he smashed in 29 league goals (48 in as many games in all competitions) to earn the Bundesliga top scorer's Torjägerkanone - the first Dutch player ever to do so - in the process equalling Klaus Fischer's one-season club record from the mid-1970s. 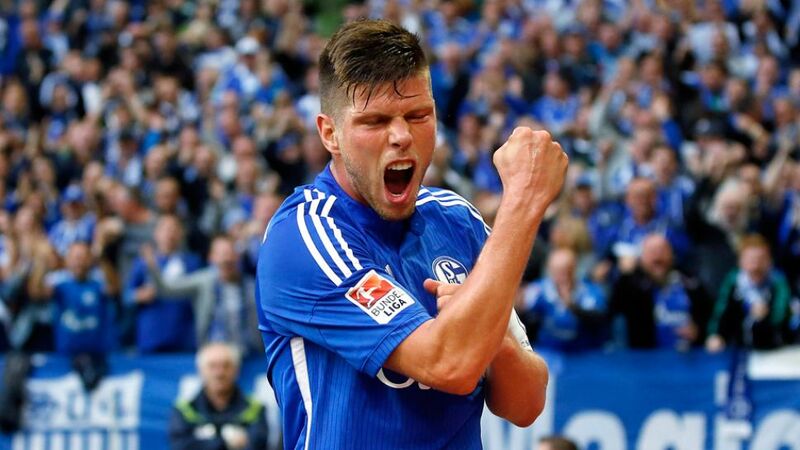 Further wearisome injuries subsequently restricted Huntelaar's Bundesliga appearances, with a concomitant drop-off in his scoring rate: he netted ten goals in 2012/13 and 12 in 2013/14. Schalke's faith in their Dutch marksman, whose contract was extended during one of his lengthy periods on the sidelines, paid dividends in the second half of the latter campaign, however, as he helped the Gelsenkirchen outfit once again secure a UEFA Champions League berth. Huntelaar was duly rewarded with a place in the Netherlands' FIFA 2014 World Cup squad - no great surprise, perhaps, given that former team coach Louis van Gaal once described him as "the best penalty-box player in the world, bar none." He lived up to his coach's expectations by assisting the late equaliser and then scoring the winner with a 94th-minute penalty in the round of 16 match against Mexico. Although 'The Hunter' turned 32 at the start of the 2015/16 campaign, it would appear to only be a matter of time before the Schalke terrace favourite - with 70 Bundesliga goals - takes top spot in the Dutch goalscoring chart.